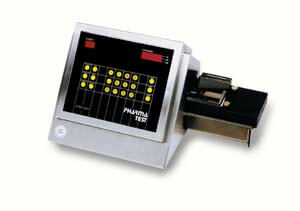 The digital tablet hardness testing instrument PTB 111EP features an integrated printer. It is a dual force mode hardness test apparatus as it can be used for either linear force or linear speed increase while the tablet hardness is being tested. It offers a multiple point validation procedure for the built-in digital load cell. The hardness testing instrument is made in strict compliance with the EP <2.9.8> and USP <1217> Pharmacopoeia. Enter the nominal test information for hardness as well as a batch number via the PTB 111EP keyboard. Select the unit to measure, KP (Kilopond), N (Newton) or Sc (Strong Cobb), now place the sample onto the sample dish and start the test. The driven jaw will run forward, touch and force the tablet until it breaks to measure the hardness (tablet breaking force). The result is immediately displayed and printed via the integrated report printer. Repeat this until your series has been tested, get a full print-out including each individual result, date, time, serial number of the instrument, batch number of the product tested, mean value and deviations of the test series. The flexibility and the reproducibility of the results have made this and other models, like the PTB 311E hardness testing instrument become one of the most sold tablet hardness testing instruments worldwide. By using an integrated report printer, the bench space requirements to of this instrument are even lower than other instruments from the PTB series, since no additional external printer is required. Furthermore, the report printer requires less paper than a standard A4 printer and by this helps to preserve our precious natural resources. Even in the existing USP and EP monographs there is no standard force setting or force increase mode established, but it is recommended to use a linear force increase rate of 20N/s. Different force settings usually cause problems when comparing results received by different supplier’s instruments when testing the same tablet. The hardness result is directly influenced by the contact speed and force increase rate. Faster operated test jaw means lower reproducibility and often higher results. In order to offer the possibility to select an operating mode which will offer you similar results as the instruments you may already use, select the force mode, linear force increase or linear speed increase and select the same or similar rate. Also touch and detection force may be altered to suit the sample design specification. When the sample is touched the instrument switches to the selected mode and linear increasing rate.